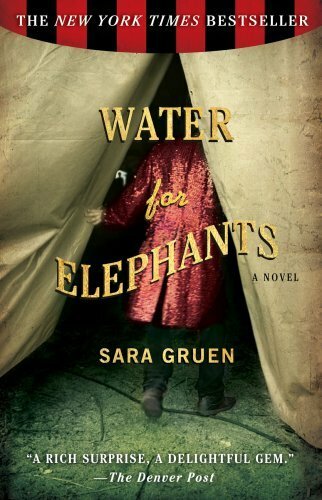 I recently read Water for Elephants, which has been made into a movie that comes out this month. I've seen it for years and it's a bestseller but I never had the urge that I had to read it. A friend I work with let me borrow it so that's what I enjoyed last night. I was suprised with the book and it was nothing like what I was expecting. The author Sara Gruen has a different writing style than I am used to. I absolutely love the circus idea. The entire book plot is with a circus. Something new and historical and interesting. The time period is perfect as well. She also portrayed elderly people in a different perspective most people don't see. On the flip side, some of the things that happen in the story are so out there, it was hard to believe what I had just read. There are a lot of sexual things that happen in the book that I wasn't too thrilled about. It was like reading a romance novel at times and some of the things I just didn't need to know. It was an interesting read, though I wouldn't read it again. More often then not I don't understand why such books are bestsellers. I have read a hundred other books that arent bestsellers but are much better written.